Asian Art has blossomed in Paris this month. Items that combined quality, rarity and provenance generated fierce bidding at sales at Drouot and the various salerooms around the French capital. An early Ming gilt bronze Buddha Vairocana that sold for €2.9m (£2.2m) at Sotheby’s. Christie's June 9 auction raised a total of €16.2m hammer and saw a huge battle for a particularly long 18th century painted handscroll. The 37ft (11.3m) long by 12in (30cm) high scroll, decorated in ink and colours with the 500 Lohan, or enlightened monks, set in a mountainous landscape, is attributed to the Qianlong court painter Gu Quan and dated to the eighth month of the 37th year of the Emperor's reign. It had been acquired in France in the early 1980s and crushed its €80,000-120,000 estimate to sell for €4.9m (£3.68m) to an Asian dealer. They also obtained €2.6m (£1.95m) for a 7½in (19cm) high Qianlong white jade bowl with an elaborate carved cover estimated at €120,000-180,000. This had a distinguished 19th century provenance from the collection of Baron Jean-Baptiste Louis Gros by direct descent. 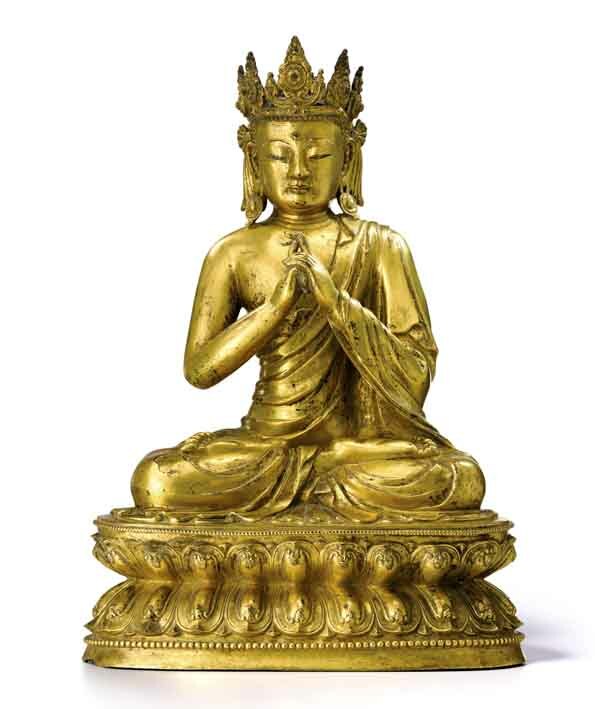 The following day at Sotheby's, a sizeable slice of their €10.3m total was contributed by a Ming gilt bronze figure of the Buddha Vairocana which had been consigned from a German private collection when it too eclipsed a €300,000-500,000 estimate to sell for €2.9m (£2.2m) to an Asian buyer. The 20in (51cm) high figure, which is dated on stylistic grounds to the early 15th century, is shown wearing a regal crown and earrings combined with simple monk's robes and is one of just two known examples of this distinct type, the other being in the Newark Museum. A busy schedule of Asian-orientated auctions at Drouot continues throughout June but the Paris auction collective had already chalked up a premium inclusive figure of €16.5m worth of sales by mid month. These included two early 1930s flower studies in oil on canvas by the Chinese-born, Paris-resident artist Sanyo (1901-1966) that came from the collection of Henri Pierre Roché and realised €3.2m (£2.4m) each in an Impressionist and Modern art sale at Aguttes on June 2. Amongst the dedicated Asian sales, Pescheteau-Badin's June 13 auction recorded a multi-estimate €320,000 (£240,600) for a 13¾in (35cm) high Yongzheng mark and period vase decorated in underglaze blue with a desirable pattern composed of registers of peony, lotus and lappets. Two days earlier in a smaller auction at Blanchet & Associés, a Qianlong period wheeled vessel of archaic Zun form shaped as a Phoenix supporting a baluster vase was battled to a double estimate €280,000 (£210,525). A full report of Asian art sales in the UK and Ireland are reported in this week's ATG print publication.